Adobe Illustrator is the leading drawing and illustration software used to create artwork for a variety of media. Illustrator CC is packed with the tools you need to create stunning images and fun artwork for print and online projects. 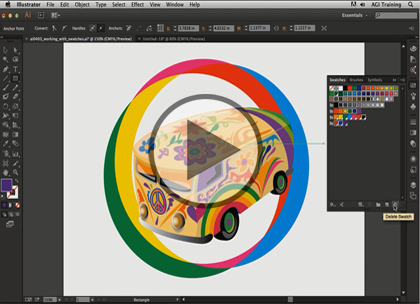 In this five part learning series, you can learn the ins and outs of maximizing Illustrator CC – from using basic drawing tools to adding special effects and beyond – with Illustrator CC Essentials. Work with pencil, type, liquefying, painting, and other Illustrator tools. Explore different effects, utilize layers, and unleash your creative side. Save, organize, and share your projects with the world. This course assumes very little familiarity with Adobe Illustrator CC. This course is part of 5 courses; Illustrator CC: Artboard &Work Space, Transform & Objects; Illustrator CC: Artboard, Live Paint; Illustrator CC: Gradients & Patterns; Illustrator CC: Layer Concept & Symbols; and Illustrator CC: Saving and Tools. Please be sure to view the courses in order if you are new to the material.